Bristol’s credentials as a city to help new businesses grow have been given the royal seal of approval from HRH The Duke of York. His Royal Highness was keen to learn more about the burgeoning technology sector and how the University of Bristol has helped to support companies which have grown roots in the city. After visiting ss Great Britain, The Duke of York met the brains behind some of the innovative companies at the University’s SETsquared business acceleration centre, which has helped start-up businesses gain the support and funding they need to become a global player. He learnt how the Centre, which was established in 2002, has attracted £56million of investment for the ventures housed there in the last four years, in addition to providing serviced office space, a business support community and on-site technology entrepreneurs. He said: “I was very impressed by what SETsquared can provide new and aspiring businesses. It’s quite clear that it has a huge role to play for the local and national economy, supporting not just people linked to the University but anyone in the city who thinks they have a viable business idea. In The Duke’s role supporting The Queen as Head of State, his interests centre around trade and investment. He also focuses his attention on helping businesses to create prosperity in the UK, enhancing social entrepreneurial activity and helping young people to develop skills for the future. 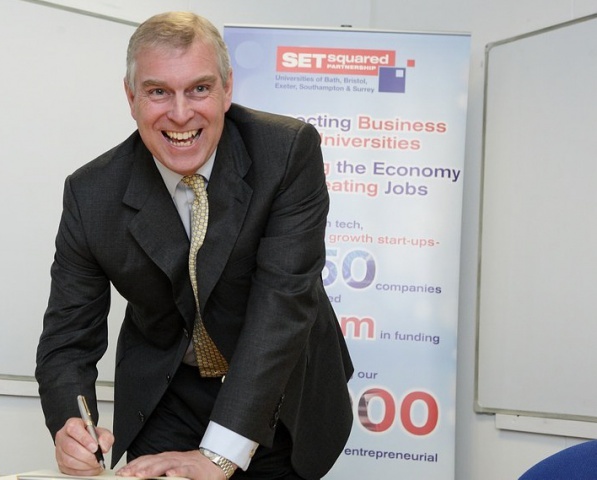 Nick Sturge, Director of the Bristol SETsquared Centre, said: “The Duke of York had heard about the work SETsquared is doing to support entrepreneurs in high-tech businesses and was keen to find out more. He met five of our 55 companies, at various stages of development, and heard how we’ve helped them grow and develop. Hybrid Logic, a SETsquared member since May 2011, has created software which makes web servers work co-operatively so that if one of them fails another one immediately takes over. And if any one of them gets too busy the other servers instantly share the load. The software doesn’t care where the servers are so even if a data centre or an entire region fails, other servers elsewhere will automatically take over and keep all the websites online. TVS was founded by Dr Mike Bartley to take advantage of his 20 years of experience in the test and verification industry. The company focuses on software testing, hardware verification and outsourcing for various types of companies, providing both consultancy and execution services using experienced engineering resources in several locations around the world. DocCom is an enterprise network for healthcare professionals founded by Dr Jonathon Shaw and Dr Jonathan Bloor in 2007. They were both doctors based in University Hospitals Bristol NHS Foundation Trust and experienced a gap in internal communication which wasted time and could also jeopardise patient safety. They figured that by using enterprise social network technology they could help health organisations and their workers to communicate easily and more effectively. The DocCom team is now 20 strong and they are set to rapidly expand their network of users from 6,000 to 100,000 in the next year. The team at Gnodal has built the largest, fastest, most efficient networks for high performance data centres. Their innovative products reduce power, cooling and ownership costs and are set to transform data centres around the world. The idea to build the world’s fastest ethernet switch evolved over a few years and a lot of corridor conversations with other designers in the Bristolsilicon cluster. By 2007, founder Fred Homewood was in a position to jump in and start-up with the help of SETsquared. Professor David May co-founded XMOS as a spinout semiconductor company from the University of Bristol in 2005. XMOS started as an undergraduate Computer Science project and is now transforming the way that electronic products are designed worldwide. Its revolutionary processors offer the fastest route from idea to product, dramatically reducing costs and time to market. XMOS has 60 employees in the US, UK, India, Hong Kong, China and Taiwan. Over the last year it has shipped more than one million devices to over 1,000 customers in 20 countries. Professor May has helped establish Bristol as a hub for microelectronic design and innovation.